When people think of St. Thomas, European fine art is not the first thing that usually comes to mind. However, this island was the birthplace and boyhood home of one of Europe's most important artists. Camille Pissaro was a mainstay of the French Impressionist movement. Indeed, he was the only artist to exhibit in all eight of the exhibits that the Impressionists staged during the 1870s. 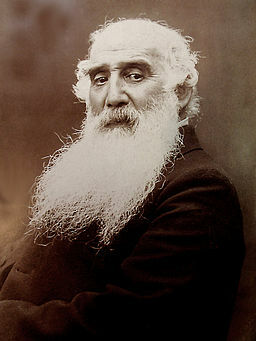 In addition, somewhat older than the other artists, Pissaro acted as a father figure and mentor to the group, particularly Cezane, Gaugain and Van Gogh. You can see elements of Pissaro's style in the works of the younger artists. While not as famous as Monet, Renoir and Degas, Pissaro's works can be seen in the major art museums of the world. When they were created, these works were savagely criticized and Pissaro sold few paintings during his lifetime. Today, the same works on the rare occasions that one comes to market command millions and the colorful Impressionist style is very popular. Jacob Abraham Camille Pissaro was born on July 10. 1830 in Charlotte Amalie, which was then a Danish colony. His father Frederick had come to St. Thomas from France after his uncle died in order to look after his late uncle's hardware business. He ended up marrying his uncle's widow. Jewish teaching prohibited such a marriage and so the St. Thomas Synagogue published a notice disassociating itself from the marriage. This led to strained relations between the Pissaros and the synagogue. They were part of the congregation but in his will Frederick left equal legacies to the synagogue and to the local protestant church. As a result of this rift, Camille attended the all-black public school until he was sent off to boarding school in France at age 12. In France, Pissaro developed an interest in art and had his initial first hand exposure to European art. However, when he returned to St. Thomas, his father wanted him to work in the family business. Still, during breaks and after work, Pissaro sketched and pursued art. Landscapes and genre scenes were his subjects - - the same type of subjects that would dominate his works throughout his subsequent career. Pissaro's art work brought him to the attention of Fritz Melbye, a Danish artist then living in St. Thomas. Melbye encouraged the young artist and took Pissaro with him when he went to work in Venezuela. Later, Melbye arranged for Pissaro to study with his brother in Paris. Leaving St. Thomas in 1855, Pissaro went on to greatness. St. Thomas also played a significant part in Pissaro's personal life. It was there that he met and fell in love with Julie Vellay, who was working as a maid to Pissaro's mother. The two had seven children together. However, they did not get married until 1871 because Pissaro's mother objected to him marrying outside of the Jewish faith. Above: Looking toward the upper floors from the courtyard of the Pissaro building. 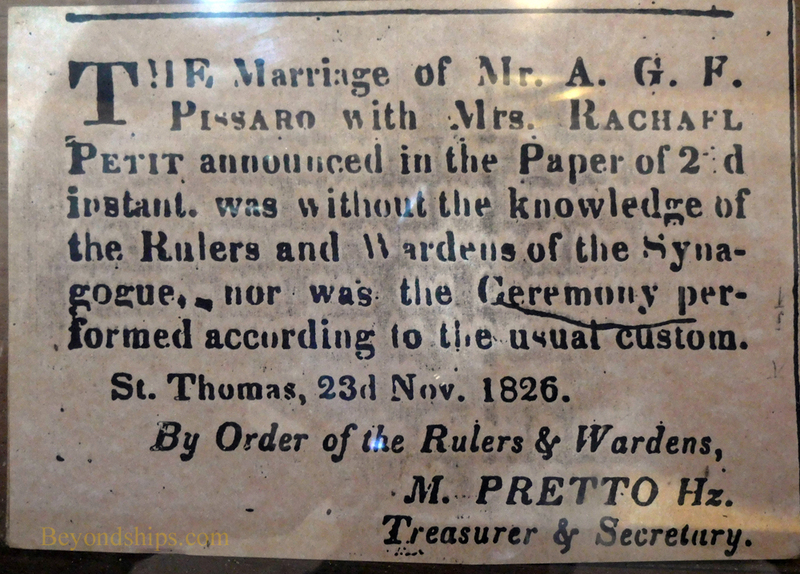 Below: An exhibit in the St. Thomas Synagogue on the marriage of Pissaro's parents. 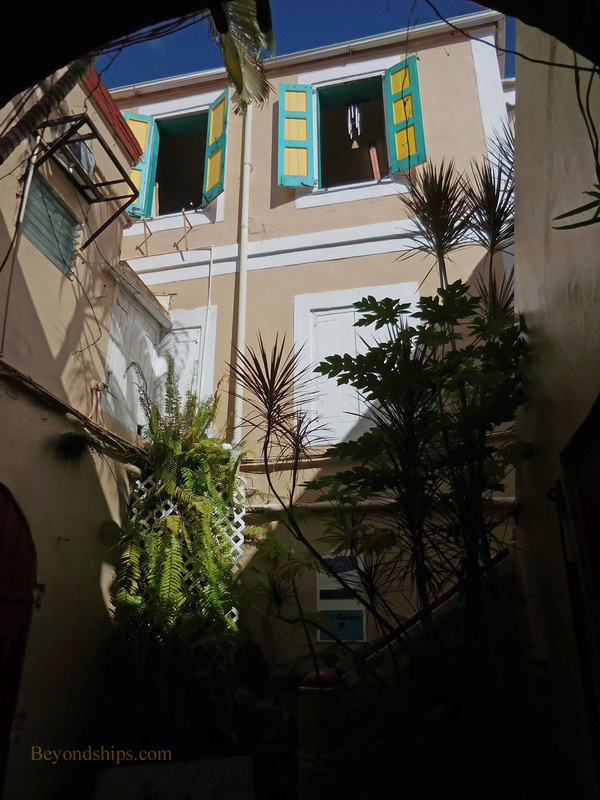 In Charlotte Amalie, there are still remnants of Pissaro's life in St. Thomas. 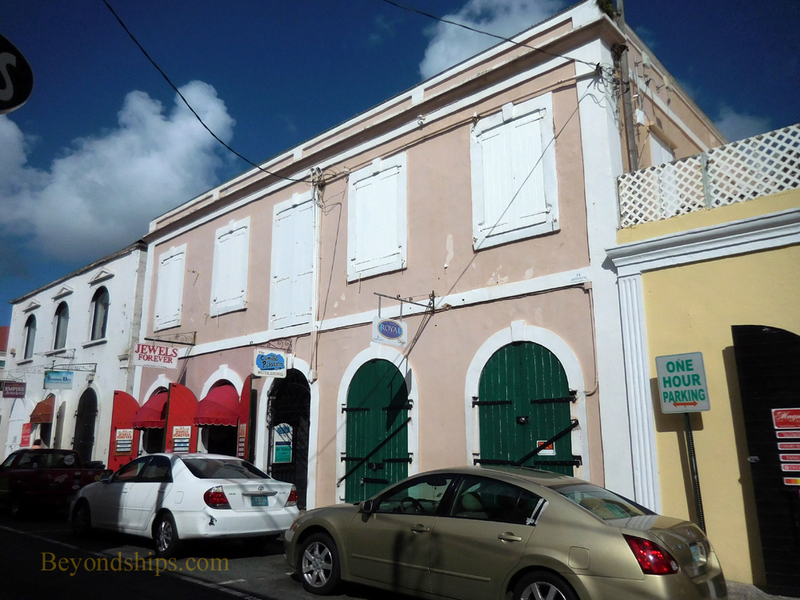 Walking down the busy main street of Charlotte Amalie (Dronninggens Gade) past all of the jewelry shops and boutiques keep an eye out for a small sign marking the Camille Pissaro building. This colonial structure is where the Pissaro family lived. As in Pissaro's day, the ground floor is occupied by commercial establishments. However, if you go through the archway in the middle of the building you come to a small but pretty courtyard. Stairs lead up to the upper floors where the Pissaros lived. It is a peaceful enclave in contrast to the busy shopping area outside. Just below the arch are a series of wall-mounted display cases. These contain a brief biography of Camille and relate the connection between the building and his life. Upstairs, appropriately, is an art gallery presenting the works of local artists. Left: Pissaro in later life.